Did you know a baby born after miscarriage is called a rainbow baby? The sign of the promise God gave Noah, the rainbow signifies hope and a reminder of the covenant we have with God - a covenant that promises life. A rainbow is also only present when sunlight hits the rain. 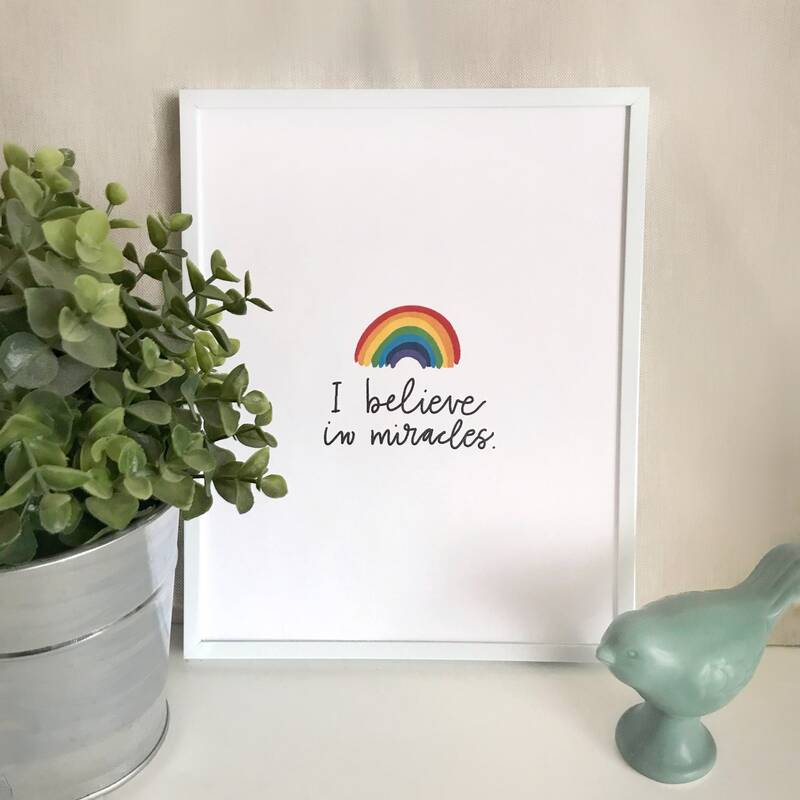 This print makes a beautiful gift for those celebrating the life of new child amid the grief of loss. The print comes unframed and un-matted. International shipping is not standard. If you would like to place an international order, please message me your address so I can calculate an exact shipping charge. If it is agreeable, I will post a special order for you. Thank you! Due to variations in how monitors convey color, please allow for slight variations between the screen image and print image. Watermarks are not present in the purchased image. Most items come with free standard shipping via the USPS within the United States. Larger / heavier items may incur an additional shipping fee. The customer is responsible for providing accurate shipping information. In the case that an item is returned undeliverable or does not arrive based on errors in the shipping address, the customer agrees to pay for a replacement item and/or additional shipping costs incurred. If you are not happy with the item your purchased, please let me know within 14 days of receipt. I'll be happy to refund your purchase (minus the original shipping costs) or exchange the item once I receive the item(s) back. Shipping costs associated with sending items back are the responsibility of the customer. Because of the delicate nature of original artwork & handmade jewelry, items must be shipped back in original packaging (or as close to original as possible). Refunds will only be applied if items are returned in good condition and able to be resold, so please package your item carefully. *** Diffuser jewerly may not be returned once used. *** I also encourage you to track your item as I am unable to issue a refund until I have received the item. For information on wholesale pricing/quantities, please contact me at rakstardesigns@gmail.com. Thank you!